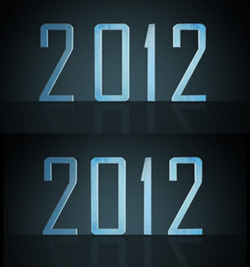 There’s a new film coming out this July called 2012. The film itself looks like a carbon copy of The Day After Tomorrow, and that might be because both films are directed by the same director. But that’s not why I’m writing about 2012. In typography, kerning is the process of adjusting letter spacing in a proportional font. In a well-kerned font, the two-dimensional blank spaces between each pair of letters all have similar area. So, in other words, it makes typography look more readable. Many fonts unfortunately have bad kerning. With some font creation applications, you can kern your type automatically, but this gives limited results. And of course some choose not to kern at all, leaving you with a font that may have beautiful letterforms, but when put together, terrible sentences. You have to wonder why the designers of the 2012 typography didn’t manually kern 2012 so it reads better. It’d be quite interesting to speak to the designer to see why they missed out such a crucial stage of type design, as I believe it’s clear to most people that the space between the two and the zero is far too much. To the right is a before and after of what the typography should look like. This took me 60 seconds to improve, but looks considerably better. It’s not hard to do and considering the typography will be used in conjunction with a high-end publicity campaign, it pays to get it right.